Since the sample was targeted at CFMA membership and CCIFPs, the results are skewed towards larger contractors and do not represent the market in general. Over what dollar amount do you capitalize tools? 41% of all respondents said that they capitalize tools over $2500. Heavy Highway contractors were most likely to capitalize at this level since they have higher dollar value assets. How do you track tools that are not capitalized? 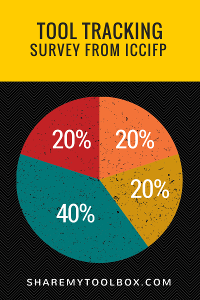 50% of the respondents do not track noncapitalized assets. 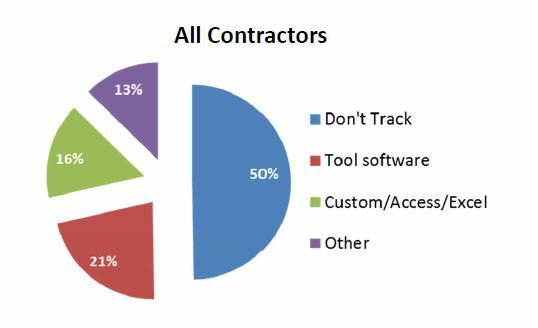 Specialty Contractors are most likely to use tool tracking software while Heavy Highway contractors are the least likely since they are more concerned about high-dollar value equipment. What is your estimated tool replacement rate? 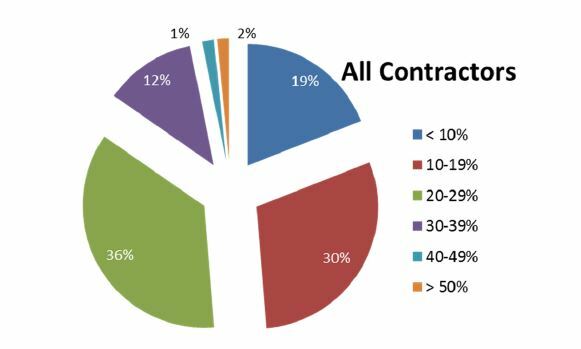 Two thirds of contractors replaced 10-30% of their tools on an annual basis. Specialty contractors led with the highest replacement rate. How do you account for project tool cost? Although nothing is a surprise, this is where the survey results get interesting. Since tools are not fully consumed on one job, and presumably used again over several jobs, it makes sense to charge tools to overhead and use an allocation factor, bnly 30% of contractors use this method though while an additional 5% use a fixed allocation. However, simplicity rules and 44% expense tools to the job as purchased and 10% do nothing. There did not seem to be much variation in costing methodology based up a contractor’s size. 23 respondents or 12% contractors said they billed tools on an hourly, daily or weekly basis to jobs. Since this was the most intensive method of costing, we wanted to understand the who and why. 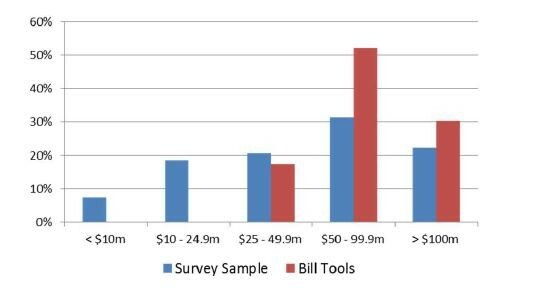 • Contractors in between $50-100m were most likely to bill their tools (52% compared to 31% of the total sample) while none under $25m billed tools even though they made up 26% of the total sample. 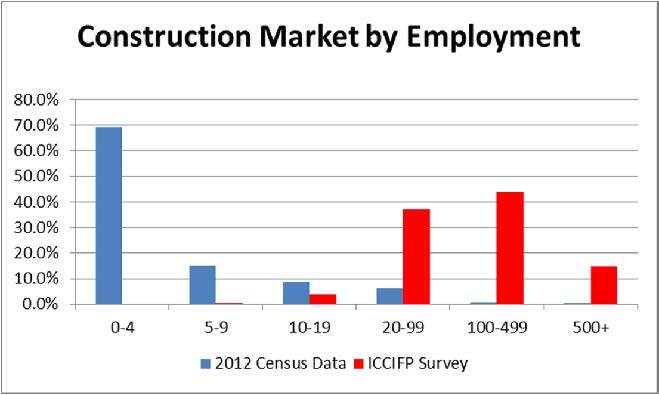 • General contractors were slightly more likely to b ill tools compared to the survey sample. Assuming you bill tools to the job via an hourly, daily, or weekly rate, what is the primary reason you do this? 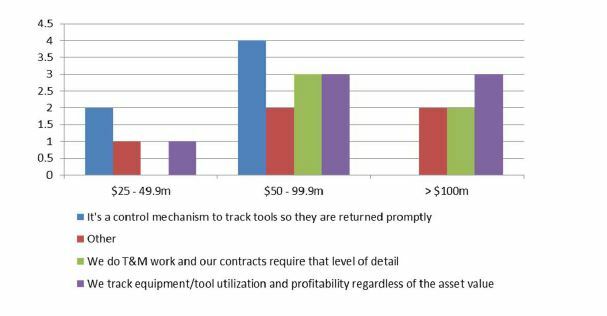 There was no overwhelming primary reason why contractors chose to bill tools – almost evenly split between the four options provided. T&M requirements would seem to be the most logical, however, it’s impossible to make a value judgement on the others without understanding the respondents’ individual circumstances. • Specialty contractors were more likely to bill tools for control reasons while Heavy Highway not at all. • None of the contractors over $100m billed tools for control reasons. • No contractor under $50m billed tooled due to T&M work. We published the first 10 pages of the survey summary on this page. For the rest of the survey or larger images please use the download link at the top of the page. Feel free to contact us if you have questions or would like further information about the tool tracking survey. More information on our Tool Inventory App can be found here. 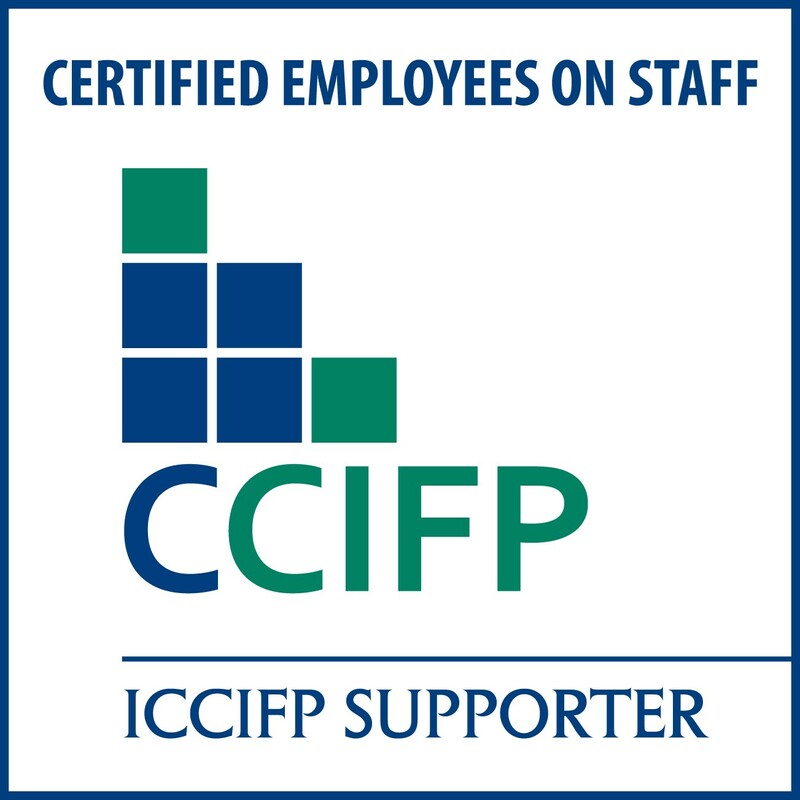 ICCIFP is a not for profit organization that promotes financial education and certification in the construction industry. To learn more about ICCIFP click here.